GF Ontario Blog: Interview with CEO of Bard's Beer! A few weeks ago I announced that Bard's Beer will soon be available at LCBO in Ontario. I hope to have a review post up soon featuring the beer but in the meantime, I was honoured to score an interview with Brian Kovalchuk, the CEO of Bard's Tale Beer Co! CEO of Bard's Tale Beer Co.
Jax: Tell me a little bit about the history of the company. What was the inspiration to craft a gluten-free beer? Brian: The founders of our company, Craig Belser and Kevin Seplowitz, were self-described beer geeks that were both diagnosed with celiac disease. That meant a lot of food and beverage items were off the table including their passion - beer. They met via the internet researching gluten-free brewing and made it their mission to develop a gluten-free beer. But, not just any gluten-free beer. It had to be a craft beer that could be enjoyed by all – gluten-intolerant or not. Bard’s was the first gluten-free beer on the market in 2006. Bard’s use of sorghum to replace barley has been followed by our competitors. Only Bard’s malts the sorghum just like barley is malted in traditional beer. Malting assists in the brewing process but also provides flavor, aroma and color to beer. Did I say only Bard’s malts the sorghum in its recipe? Jax: What kinds of ingredients did you experiment with in creating Bard's Beer and what made sorghum the winning ingredient? Brian: Craig Belser did the experimentation with alternate grains. He made beer with every gluten-free grain available including millet, amaranth, rice, corn and sorghum. Craig also malted all the barley-substitutes understanding the importance of a malted grain in brewing. Sorghum turned out to be the best substitute. Craig experimented with many different cultivars of sorghum. His final choice is now proprietary and we contract with farmers to grow it for our exclusive use. Jax: How did you craft a gluten-free beer without the use of syrups? I notice most other gluten-free beer use syrups. Brian: Bard’s malts our proprietary cultivar of sorghum and then brews it into an extract. This sorghum malt extract is then pumped into the brew kettle avoiding any potential cross-contamination issues with the brewery’s grain handling system. It is extremely important to ensure that Bard’s is gluten-free and we have procedures and testing in place from the farm to the bottle. Jax: How does Bard's Beer compare to regular beer brewed with barley or wheat? Do people without gluten sensitivities notice a difference? Brian: We get quite a few testimonials from people saying their non-celiac spouse / friends enjoy Bard’s and cannot notice any difference in taste compared to traditional beer. I like to do taste tests with our distributors. We compare Bard’s to the gluten-free competition and then to craft lagers. Eyes are opened as people taste the difference between our malted sorghum beer and our competition and then the similarity to traditional lagers. Beers need to be compared within a style. For example, someone that enjoys IPA’s won’t like light American lagers and vice versa. Jax: Are you gluten-free yourself? What prompted you to get involved in the Bard's Beer company? Brian: I am not a celiac or gluten-intolerant but I do try to avoid certain products containing gluten like bread. I support the on-premise locations that carry Bard’s and drink Bard’s but I do have to sample new products from time-to-time. In my previous life, I led the turnaround of Pabst Brewing Company as CEO. We accomplished a lot and the PBR (Pabst Blue Ribbon) story is unique in the U. S. beer industry with its strategy, tactics and results. Our team invented guerilla / word-of-mouth marketing. That said, I had been commuting Monday through Friday for thirteen years with Pabst and before that Benetton. It was time to return to my home and family in Minneapolis full-time. Contacts there put me in touch with the Bard’s founders that were exploring malting options. I liked the beer and the market potential. They liked my experience and availability and here we are. 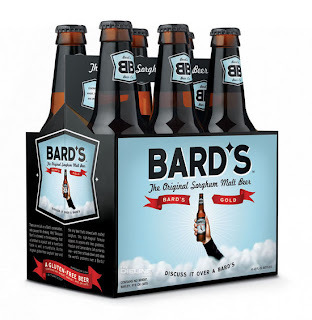 Jax: Since Bard's Beer is so popular, are there plans to create different styles of gluten-free beer in the future? Brian: It is time for more styles from Bard’s. In the beginning we had to convince distributors and retailers in the United States to carry us. Now they want more styles. Jax: Is there a possibility of having it sold in the Beer Store in Ontario? Or will it only be available through LCBO? Brian: Jax, it is something we will evaluate as Bard’s is accepted in the Ontario marketplace. Jax: Will Bard's Beer be available in bars and restaurants in the future? Brian: We intend to develop a presence in the on-premise channel. More and more people are demanding a gluten-free beer alternative on-premise and bars and restaurants are responding to the demand. We have a great product, brand recognition and an ability to market the retailers that carry Bard’s. We also have an agency ( North American Craft ) in Ontario that can make this happen. Jax: Is there anything else you would like the readers of Gluten-Free Ontario to know about Bard's Beer that hasn't been discussed already? Brian: Everyone can learn more about Bard’s at www.bardsbeer.com. In particular, we have a beer locator function and will have the LCBO stores where Bard’s can be found up as soon as possible. We are also very excited to soon be available in Ontario. We have been available in BC, SK, AB and NS for some time. The gluten-free community communicates very well and we have some pent up demand for Bard’s in Ontario that we are now happy to be able to satisfy. You can also view more information on the Bard's Beer sell sheet PDF file.